One of my favorite annual garden events occurs in my own backyard ~ the arrival of the relict trilliums. They are absolutely stunning! These beautiful trilliums are native to my area. They are also on the endangered list, so I feel extremely lucky to have them scattered about my yard. I look for their leaves to begin peeking out of the ground in early February and celebrate their blooms as though it was a fiftieth anniversary spectaclar. 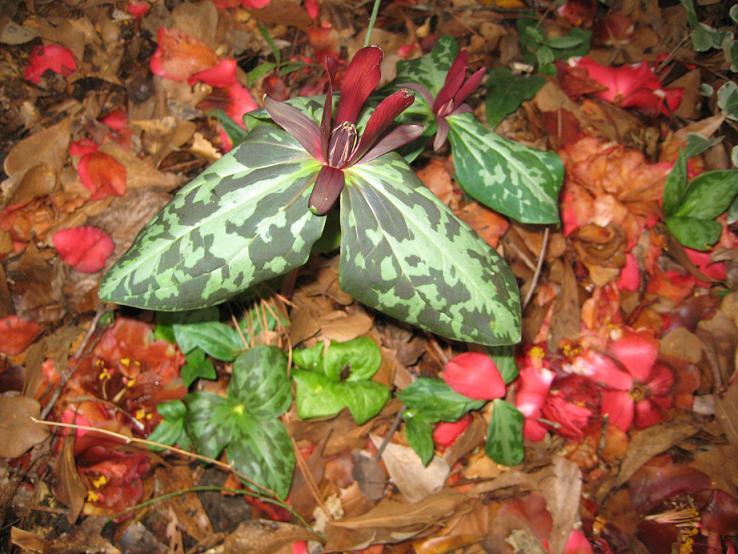 A curiosity about the trilliums on my property is that they are most often found snuggled under a nandina, although a few do pop up sans nandina. When I first discovered these beauties, I wanted to know more about them so inquired at my local nursery about their care. I was told that 1) I was extremely lucky and 2) I wouldn’t have much luck moving them from one part of my property to another. I was in a dire situation ~ move the trilliums or lose them completely. Losing them was not an option. It turned out that transplanting wasn’t difficult at all. I’ve been quite successful moving these lovely plants when I had to ~ clearing a bit of the yard that was being taken over by those horrible, uninvited smilax vines that love wrapping everything up in their prickly, thorny evilness. I hate those vines! Devil plants! Tip: If you must transplant, take a big chunk of earth with each plant so as not to disturb them more than necessary and to move any babies that may not be visible. I had a roque trillium pop up in my sunny lawn last year and carefully transplanted it to live with some of its cousins in my shade garden. The shade garden has a hardwood canopy, azaleas, camellias, oregon grapes and some plants that I still haven’t identified but adore. The trilliums are the little miracles, though. 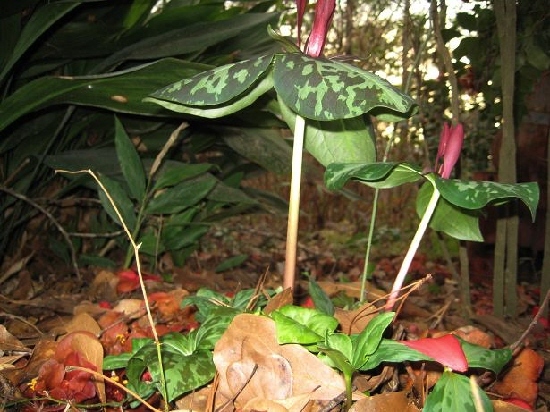 The bottom line is that each transplanted trillium survived and is thriving in their new home. Look at all the little babies popping up under a camellia. 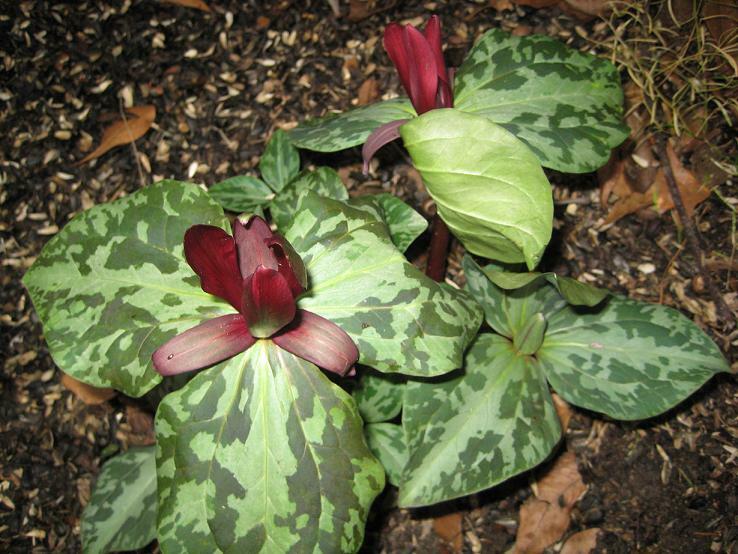 A couple of fun common names for the trillium are wake robin and toad shade trillium. Maybe I’ll set up a little toad house near these. If you find a trillium in the wild, please please please do not remove it because of their status as an endangered species. Look for them at nurseries instead. Culpepper doesn’t list any kind of trillium in his herbal. Scott Cunningham lists trillium spp. as a feminine water plant of Venus. Read about Trillium flowers essences at Vibration Magazine. One last photo ~ from the toad’s point of view. P.S. Sorry about the quality of the pics. I’m a pretty good lunartic, but not a very good photographer. You must have an awesome garden! Maybe post some pics? I would love to see it! The trillium pics are all from my garden. There’s not much to see right now. Mostly a lot of after-winter clean up and spring prep. I’ll chronicle some things through the coming months, though, and maybe pull out some old pics. (For inspiration?) Some years are better than others around here. Last year was too hot to go outside, so everything suffered. I’ve got my fingers crossed that this year will be better.